Lewis Hamilton says he wants to win the season's final two races even though he would win the title by finishing behind rival Nico Rosberg in both. Hamilton would be champion by finishing third in Brazil on Sunday and second in the finale in Abu Dhabi even if Mercedes team-mate Rosberg wins both. 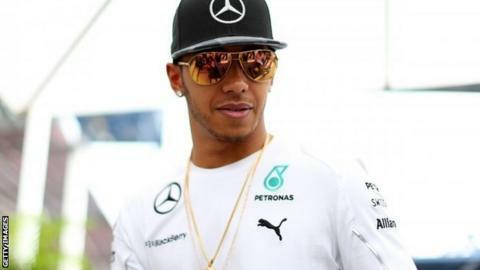 But Hamilton said: "I want to win the world championship by winning, rather than finish fifth or wherever. "I'm not coming to these last couple of races with a game plan. I want to win." Hamilton has a 24-point lead over Rosberg in the championship after winning the previous five races. But the controversial award of double points in Abu Dhabi means he could lose the title if he fails to finish there even if he wins in Brazil. But Hamilton, who has won 10 races to Rosberg's four so far this season, said he was not dwelling on whether double points was fair or not. "What is fair?" he said. "It's the same for everyone. This whole double points thing has always been a question. It is the way it is. I don't really know what to say about it." He added: "I don't have any fears because I really feel like it has not been lucky or by mistake where I am today. "There are reasons for me being in this team, reasons why we have the best car, reasons why we've had these results this year. And that's all the hard work that's gone in. "And I really feel I have utilised every experience I've had this year, or at least recovered if I have not utilised it. "So I feel comfortable where I am. I'm going to do whatever I can do and whatever the result at the end of it is, it is the way it is. "But I will know I did everything I could and I'm not going to look back and think I could have done this or that, and that's why I'm excited." Rosberg was an outspoken opponent of double points at the beginning of the season, saying the idea was "no good", but he joked on Thursday at Interlagos: "I do now. It's really a fantastic idea." Asked how he would respond if he won the title and people criticised his victory as hollow, he said: "I wouldn't respond. Everybody can have their opinion and in sport it's the points that count in the end and of course then you can debate who deserved it more or less. That's always going to be the case." He admitted he needed Hamilton to hit problems to have a realistic chance of overhauling him. "It's clear that I need to rely on something happening," Rosberg said. "For sure, there's not enough for me to win (if it doesn't), unfortunately, but that's the way it is. "Anyways, in sport, so much can happen, so I'm still very optimistic."